Australian Kent Music Reports Single chart in January 1977. 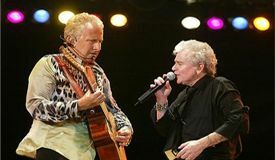 Their first album by the name of “Air Supply” came out in December 1976 and it met great success during its time. It reached 17th ranking on the Kent Music Report Album chart. Their first album also achieved Gold Record status in Australia. Feel the magic in the air by joining their concert that is going to happen in May in Las Vegas. They are widely regarded as one of the most interactive live performing bands. You just need to listen to their tunes including “Here I Am” and “Two less Lonely People in the world” to understand why they are adored to this date and how their music has passed the test of time. Unlike many other singers, Hitchcock and Graham Russell seem to get better with age. After four decades of touring, they still sound the same. Air Supply still has the best romantic songs and no one has been able to top them off until now. They perform with a level of experience and professionalism that no other band holds. Their concerts are a trip down the memory lane. The duo has an onstage chemistry that is very difficult to explain in words, they have developed such a sense of communication in last four decades that no one else can top them in live performances. Their harmonies cascaded coordinated, Hitchcock’s multi-range tenor is the ideal partner to Russell’s vocals. Hitchcock still shows that his voice has not lost the magical touch. It is still capable of holding notes that would shame many of the current chart-topping singers. Russell still has that twinkle in his eyes and every now and then fancies some quirky steps as well. Hitchcock’s voice still has the magic, simply astounds, and steals the show every time he performs, soaring up into high notes and moving into lower ones with extreme expertise that would leave singers of this generation in dust. The Duo thrives on the response of their fans and their response is what has kept them going until now. During every performance, they have a very strong level of interaction with their fans and they show a great respect towards their fans that unfortunately is not the case with singers of the current generation. They are on tour around 200 days a year, which is a huge feat for someone of their ages. Singers nowadays cannot even properly handle fifteen to twenty gigs a year, let alone more than one hundred and fifty concerts a year. A person feels attached to them and special during their performances thanks to their skill of interaction with the audience. Their concerts are a joy for an older audience, as seen in their last few concerts, people are very enthusiastic about their concerts and are constantly jumping of their chairs to catch a glimpse of the performers and are also dancing and singing along with their favourite tunes. They carry a variety of talents and produce a show, unlike others. Their songs can range from slow and steady to full on heavy tunes. All this performed with a touch of brilliance, no auto tune or sound effects, just pure music like the one it used to be in the 80s. For a couple of ageing rockers, they put everything into their performance. Their performances are nothing short of brilliant. Like all the wonderful bands of the past, they pour their heart and soul into their performances and visiting their concerts is a worthwhile experience.